A few months ago, our friends at InfoTrends (now a division of Keypoint Intelligence) released a new study titled “Lead with Data: Follow with Print.” We’re always intrigued by the research published by InfoTrends because of the methodology they employ and the insight they provide. This study set out to define how sophisticated marketers are utilizing data and whether their current use of data works to improve their results. One of the most interesting areas of the research for us was the focus on how data is being used for paper-based and digital marketing campaigns. If there was any question about marketers recognizing the importance of reaching customers and prospects with a targeted message with the right channel at the right time, this study proves that CMOs know they need an effective solution for integrated marketing in order to increase sales. An intriguing element of this research was the makeup of the survey sample. InfoTrends spoke to both marketing executives and agency executives about the effectiveness of multiple channels, including direct mail, email, social, and search. They also included review channels which may provide some of the best insight about how consumers make purchase decisions. According to the survey, the level of marketing sophistication across the survey sample varies greatly. Despite what we may think of as “table stakes,” more than 35% of the 256 marketing professionals who responded said that obtaining data on customer behavior and other attributes represents a significant or critical challenge. Aggregating data from multiple sources and channels is also a critical challenge, as is keeping data clean for effective content delivery and compliance. We suspect the compliance component of that challenge is what keep marketers awake at night, as it may represent a dead end on the customer journey map. The survey identified the key elements of an effective data-driven marketing approach. As we often tell our clients, success is not possible without investing in discovery. It’s critical to understand what data is currently being used and how it’s being used. Even the most sophisticated marketers benefit from making discovery the first step in their campaign planning. The survey pinpointed data enhancement and predictive analytics as the next steps in the data-driven marketing process. Predictive analytics use behavioral insights to drive desired response across segments that were identified in the discovery process. 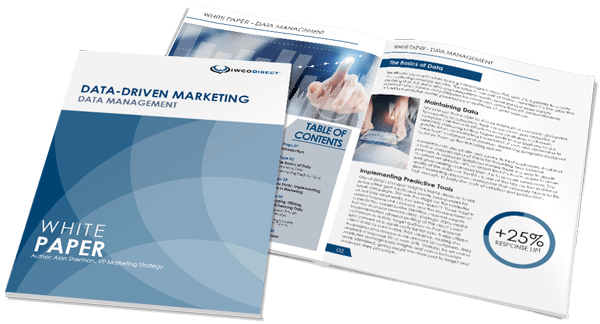 The ability to optimize this segmentation using digital print for paper-based marketing drives success in the direct mail segment of integrated marketing campaigns. Finally, response tracking of both online and offline data is necessary to optimize analytics and drive the desired results. Of course, tracking online data must include analysis of search, clicks, social activity, downloads, chat, surveys, and so much more. The survey shows that coordination of online and offline data to measure response remains a challenge, and for most marketers, the search for the “holy grail” of an effective solution for attribution continues. If you’d like to learn more about the research or need to refresh your data-driven marketing strategy, don’t hesitate to contact me so I can introduce you to our resident data-driven marketing experts.